World champions Germany go head-to-head with Poland in a match that could decide who tops Euro 2016 Group C. Who will win? 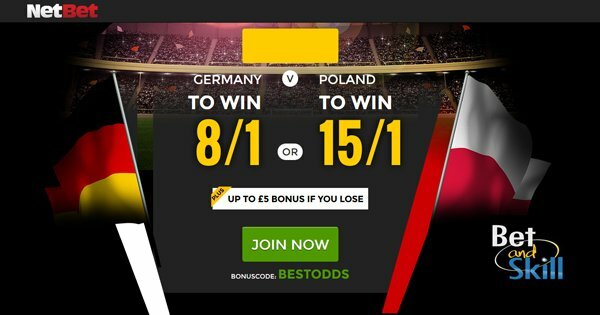 This article contains our Germany v Poland betting preview with the predictions, betting tips, enhanced odds, probable line-ups, free bets and no deposit bonuses on Thursday's night clash. Germany kicked-off their campaign with a 2-0 win over Ukraine on Sunday. Actually, it was a tough match for the World Champions. Mario Gotze struggled to get in the match against Ukraine as he played in the false nine role and only a Bastian Schweinsteiger’s late goal spoiled the party slightly. Germany and Poland were also drawn in the same qualifying group. Joachim Low’s side won 3-1 in Frankfurt and went on to qualify from the section as the group’s winners. Manager Joachim Low could name an unchanged side for this clash, with Mario Gotze handed another chance in attack despite Mario Gomez is pushing for a start. Mats Hummels misses out for Germany here, meaning Shkodran Mustafi should partner Jerome Boateng at the heart of the defence. The offensive trio of Muller, Draxler and Ozil is likely to be confirmed. Poland saw off Northern Ireland 1-0 in their opening match as Arkadiusz Milik grabbed the only goal of the game against Michael O’Neill’s men in Nice. Nawalka's men have proven during qualification that they cause Germany problems as they beat 2-0 Die Mannschaft in qualifying for this competition. Anyway, it was their only win in 20 direct matches. Goalkeeper Wojciech Szczesny sustained a thigh problem against Northern Ireland, but he is expected to start. Returning for Poland is winger Kamil Grosicki – who appeared as a substitute against the Irish – with youngster Bartosz Kapustka also relegated to the bench after impressing. Milik and Lewandowski will lead the line once again. "Germany v Poland predictions, betting tips, lineups and free bets (Euro 2016 - Group C - 16.6.2016)"